Today's collaboration is inspired by an upcoming Slovenian holiday, which is called Martinovo (on the 11th of November). In our country this is known as a wine celebration day. This is the day when grape juice turns into wine. At this day some may even prepare a feast which consists of goose as main dish. My family has weekend house and we have a grapevine there. My dad is the one in charge of it and every year we make a few liters of wine for our use. I personally don't drink wine, but I do help with picking the grapes. In this spirit of trying to bring some of Slovenian culture to my non-Slovenian readers, I paired with Tara from The Beauty of Nail Polish and we prepared a post inspired by wine. I did red wine inspired makeup and she did wine inspired nails. I may not drink wine, but deep red shades are one of my favorites to use in makeup, especially in this season (autumn). Tara is a fellow Slovenian beauty blogger, which I didn't have a chance to meet in person yet. Her blog will make you fall in love with the latest nail polish shades and inspire you to improve your nail art. She also has a lot of product reviews, so don't let her blog name mislead you. If you don't know her yet, take a stroll down her blog. 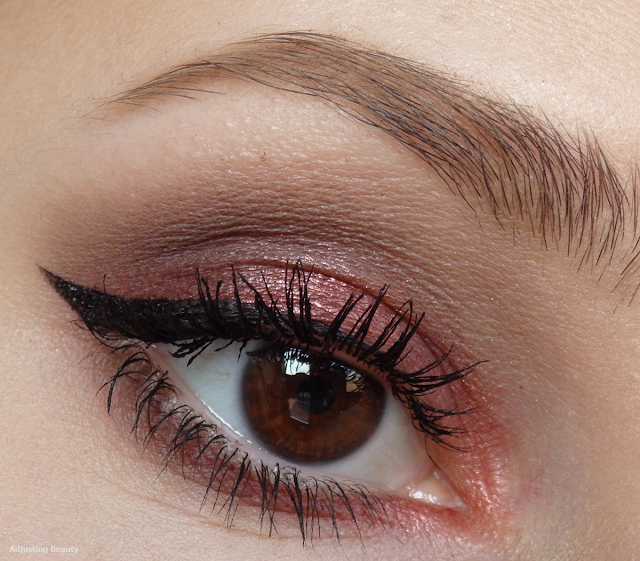 I started my eye makeup by using light taupe shade in the crease. I darkened it up with darker taupe grey. I added dark dirty red on the lid as a base. 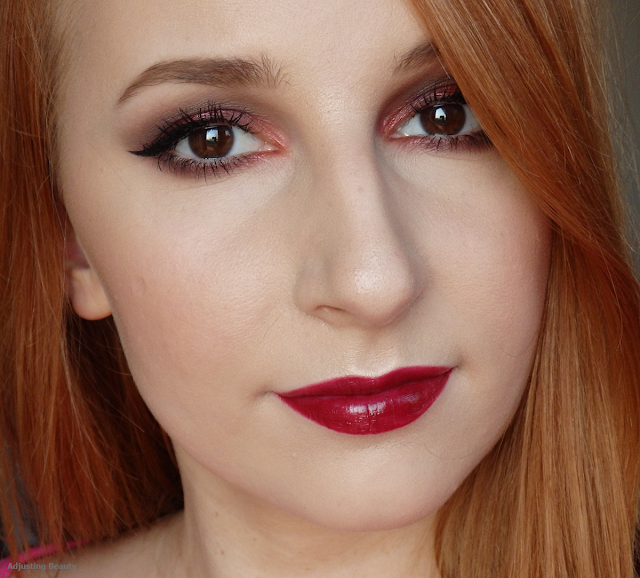 Then I used shimmery cranberry red and applied it only in the center of the lid to create a bit of light and 3D effect. I used the same shade in the inner corner. Around the lower lash line I used the same light and darker taupe shades. I also added a bit of red. For my liner I tried to make a thicker line in the outer corner and not go all the way in the inner corner of the eye. I finished with black mascara. I decided to go for dark red lips as well. 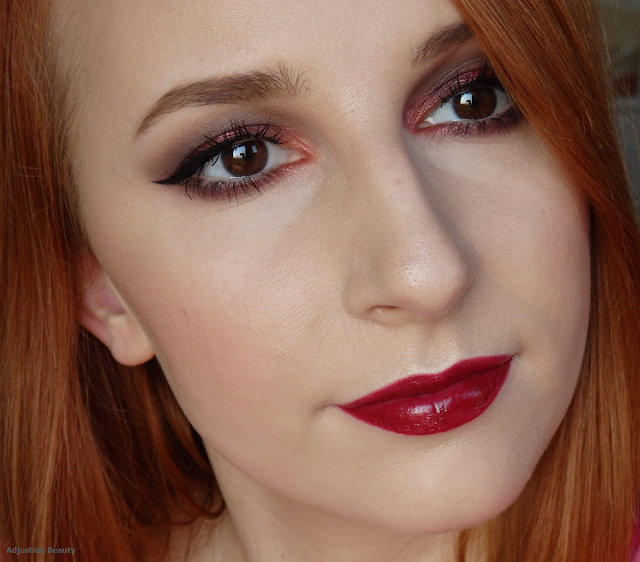 Firstly I applied dark red lip liner and went over it with dark red burgundy lipstick to give me some shine. On my face I used foundation, concealer and powder as always. I used matte light bronzer as well as added some light matte contour shade. For highlighter I used shimmery champagne shade and on my cheeks I used red based peach shade. I hope I inspired you to include some red in your autumnal makeup. 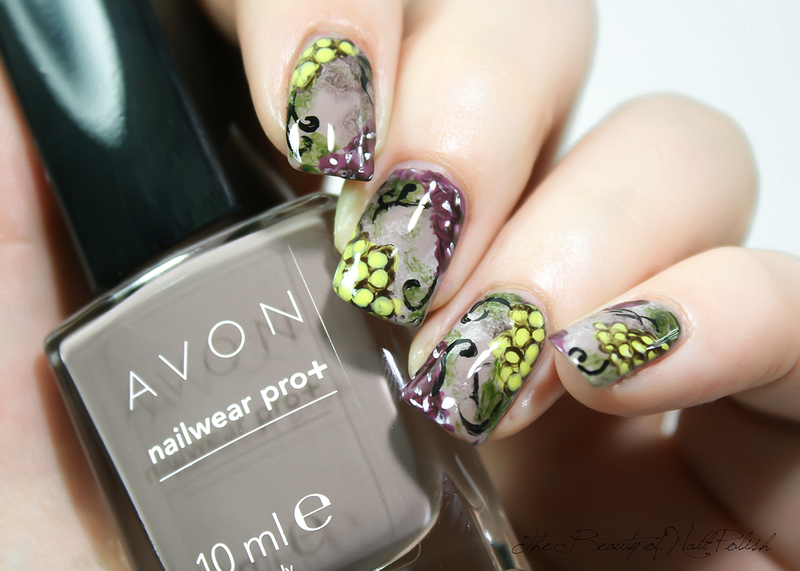 Now head over to Tara's blog to pair this look with some awesome grape nails. It looks so artistic and it's a free hand design made only with nail polishes. Gorgeous right? She also did a much better job at describing this holiday so go over on her blog and read some interesting history about our holiday ;). Hvala :) <3 Je kar veliko rdeče :). Fuuul lepi odtenki! Res mi je všeč, barve so zelo nosljive! Hvala :) Temno rdeča je moj najljubši odtenek za jesen, tako da mi je bilo to super ustvarjati :). 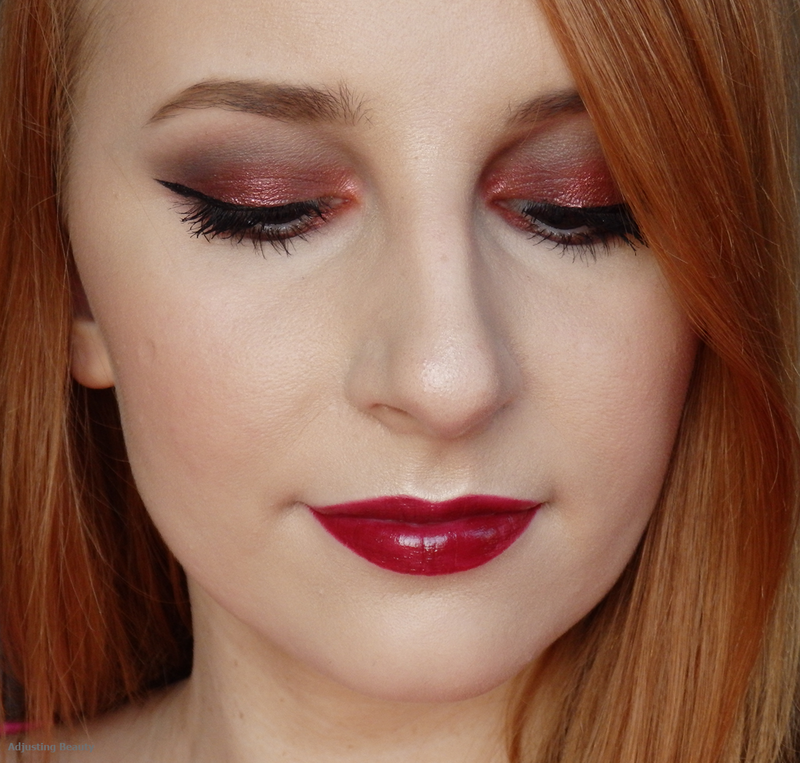 Hvala Monika :) <3 Z tem namenom tudi rada vljučim tutoriale, če je komu res všeč kak makeup in ga želi tudi sam narediti ;).